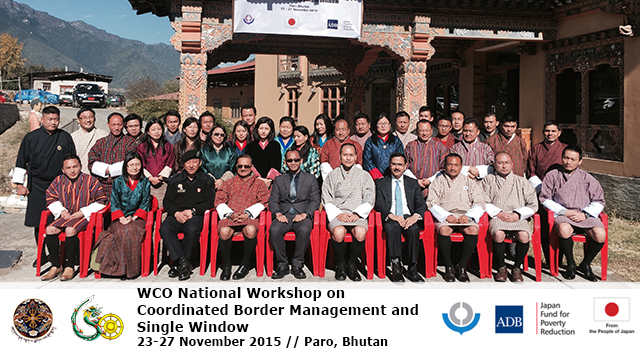 Bhutan’s Department of Revenue and Customs (DRC), Ministry of Finance, in collaboration with the World Customs Organization (WCO) and the Asian Development Bank (ADB) held the Coordinated Border Management and Single Window Workshop, on 23-26 November 2015, in Paro, Bhutan. A one-day seminar was also conducted on 27 December for members of the National Transport and Trade Facilitation Committee (NTTFC) of Bhutan, as the principal coordinating mechanism of cross-border trade. In 2014, Bhutan formally acceded to the Revised Kyoto Convention (RKC), as part of its ongoing Customs modernization and harmonization reform measures under the South Asia Subregional Economic Cooperation (SASEC) Program. In line with several of the key principles of the RKC – including, but not limited to (i) coordinated interventions with other border agencies, (ii) maximum use of information technology; and (iii) standardization and simplification of the goods declaration and supporting documents – the Government of Bhutan is embarking on the development of a national single window (NSW). The Workshop provided detailed theory and practical hands-on sessions on coordinated border management, developing and operating an NSW in the context of coordinated border management, business process analysis, an introduction to the WCO data model, and other aspects of NSW systems. WCO resource persons also shared international best practice in these areas. A total of 32 participants attended the workshop from 23-26 November, representing various government agencies involved in at-border and behind-the-border trade facilitation activities and including DRC, Department of Industry, Bhutan Agriculture and Food Regulatory Agency, Bhutan Standards Bureau, Department of Trade, Ministry of Information and Communications, Royal Monetary Authority, and Bhutan Chamber of Commerce and Industry; and with representatives of the private sector. A one-day seminar was also held for the high-level members of the NTTFC on 27 November to deliberate policy-level implications and actions required for development and implementation of an NSW. WCO resource persons briefed the participants on WCO support in the implementation of the World Trade Organization Agreement on Trade Facilitation, the strategic value of coordinated border management and NSW, and the challenges, potential solutions, and lessons learned in developing an NSW. Sufficient ICT infrastructure and connectivity to ensure inter-operability of coordinated border management and an NSW system. 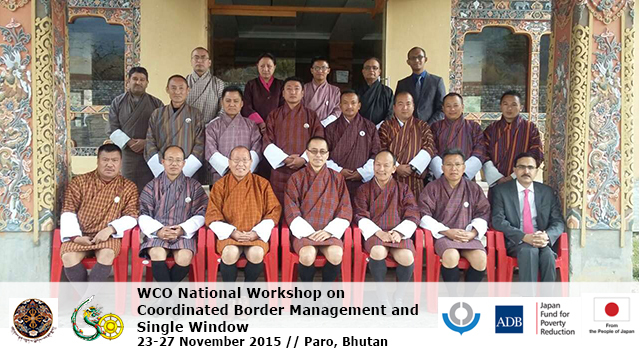 WCO technical experts conducted the workshop and the one-day seminar. ADB financed the workshop through a Japan Fund for Poverty Reduction national technical assistance project “Supporting Participation in the SASEC Trade Facilitation Program”.